Sunday we celebrated the 8th and final Sunday in the season of Epiphany. The children acted out the Transfiguration in the MegaZone before transitioning into the Gold and Silver Zones to make their final symbol and assemble their mobile. The children made a stain glass of Jesus that showed the light that God shone on Jesus during the Transfiguration. This symbol reminds us that God speaks through Jesus and we need to listen to him. This Sunday we are journeying into the first Sunday of Lent. In following with Father Kendall's sermon, we will be focusing on the theme Look Carefully How You Walk. The children will learn about the temptations that Jesus faced in the wilderness through games, a lego short film, and an interactive foldable. This Sunday our lesson will be coming from Matthew 4:1-11. KidZone is looking for additional volunteers! I am looking for volunteers who are interested in volunteering one or two Sundays a month during Children's Church. Please let me know if you are interested! This past Sunday kicked off my first official week as a Christ St. Paul's full-time staff member! I am beyond excited to finally begin spending my days planning for and working with the children of CSP to help them to continue to develop their relationship with the Lord. After spending time on February 11th, learning about and making the commitment to 'Love Like Jesus,' this past Sunday we focused on 'Loving our Enemies.' This is a concept that is often very challenging to adults and children alike. Through Jesus' teaching on the Mount, we learned that God wants us to love and pray for our enemies and those that make our lives hard. Many times, it is much easier to seek revenge or respond to evil with an insulting slap but as Christians, we are encouraged to respond in love and prayer. The children made one of their final Epiphany symbols, a cut out of their hands. On their cut out, each child wrote some of their prayers. These hands are a reminder of our need to pray and love our enemies. When visiting Ms. Lori's room, I had the special opportunity to witness first hand the art of loving those who have made your life challenging. Two of our youngest members had a disagreement. As I entered the room, they were apologizing to one another and were hugging to offer love and forgiveness. This lesson came from the teachings in Matthew 5:38-48. This Sunday in KidZone, we are going to study Matthew 17:1-9, the Transfiguration. We are going to go on a journey with a caterpillar, a butterfly, Jesus, Peter, James, John, Elijah, and Moses. This Sunday we will also be making our final symbol and putting together our mobile. Come and join us at 10am to see what a caterpillar and Jesus have in common! Yes, I will love like Jesus! This past Sunday, we studied Matthew 5:21-27 in KidZone! The children, leaders, and I learned of the promises that Jesus made to his friends and followers on the Mount. These promises reminded us that we need to follow through with what we say, mean what we say, and get along with others in the way that God wants us to do. All of these things, help us to love like Jesus. The children used symmetry to create a heart to decorate that serves as a symbol to remind them to love like Jesus. This Sunday, we will continue to learn all that Jesus taught during the Sermon on the Mount. Through Matthew 5:38-48, we will learn to love our enemies. SALT AND LIGHT IN KIDZONE! Last Sunday, we learned how we serve as the Salt of the Earth and the Light of the World. As the Salt of the Earth, we are able to influence the world for good. As the Light of the World, we are able to show others the light of the Lord through our actions. 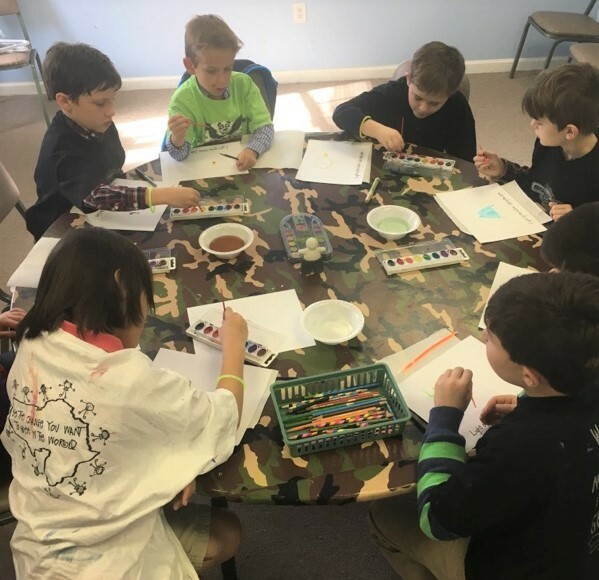 In KidZone, we used watercolors to illustrate light and we used salt to create a magical special effect to our works of art. This Sunday, we will continue to learn all that Jesus taught during the Sermon on the Mount. Through Matthew 5:21-27, we will learn to love like Jesus. Christ-St. Paul's Church is a vibrant, Spirit-filled Anglican church located in western Charleston county, SC. A member of the Diocese of South Carolina, CSP is centrally located to the communities of Hollywood, Ravenel, Edisto, Yonges Island, Meggett and Adam's Run.